Click the statements below that best describes you. Because I want/need to also have remote control via a tablet. I want to operate one interface. Because faders control multiple functions depending on what “layer” of the mixer you’re on. Digital faders provide more precise control. Because I often have to have the mixer out of my line of sight. Digital faders reduce the potential for accidents. Because digital faders reduce complexity and cost that I don’t want/need to pay for. You won’t find more mixer capability in such a compact package anywhere else. It sounds like TouchMix might be a great choice for you. Everything in the TouchMix is designed for maximum performance and efficiency. It sounds like TouchMix might be a great choice for you. Wireless control is incredibly intuitive and easy with the TouchMix Control App for iOS and Android devices (available for free at the App Store - no mixer required to explore its operaton). Should wireless go down, you still have full hardware control at the mixer. It sounds like TouchMix might be a great choice for you. You can have nearly unlimited screens and functions available via wireless devices, creating your own customized “cockpit” of controls under your fingers. It sounds like TouchMix might be a great choice for you. The TouchMix Control app for iOS and Android is essentially identical to the TouchMix physical control and layout for a seamless experience. It’s available for free at the App Store - no mixer required to explore its operation. It sounds like TouchMix might be a great choice for you. TouchMix has a touch-and-turn interface. The rotary master controller gives you precise, tactile control over any function and also serves as a high definition rotary fader control. Most people find it every bit as satisfying as a physical, linear fader and many now actually prefer it. We encourage you to try it for yourself. Along with the tactile feel of the TouchMix touch-and-turn interface, TouchMix offers the TouchMix Control App for hand-held devices. On tablets, this interface is essentially identical to what’s found on the hardware mixer, making moving back and forth between tablet and mixer a unified, seamless experience. The app is available for free at the App Store (no mixer required to explore its operation). TouchMix might be a great choice for you. The TouchMix Control app for iOS and Android tablets is essentially identical to the interface found on the hardware mixer, making moving back and forth between tablet and mixer a unified, seamless experience. It’s available for free at the App Store (no mixer required to explore its operation). It sounds like TouchMix might be a great choice for you. With TouchMix, making on-the-fly adjustments is fast and easy. It sounds like TouchMix might be a great choice for you. Once you select a channel on TouchMix, the large rotary master controller is now active for that channel. You can “ride” the controller just like a physical, linear fader. Just touch and turn. You’ll be surprised how fast and easy it is to make critical adjustments on the fly with TouchMix. We encourage you to try it for yourself. The TouchMix-30 Pro is equipped with a 10-inch multi-touch screen that allows simultaneous hands-on control of four faders. The TouchMix Control App for iOS and Android tablets is fully multi-touch and available for free at the App Store (no mixer required to explore its operation). We encourage you to try it for yourself. 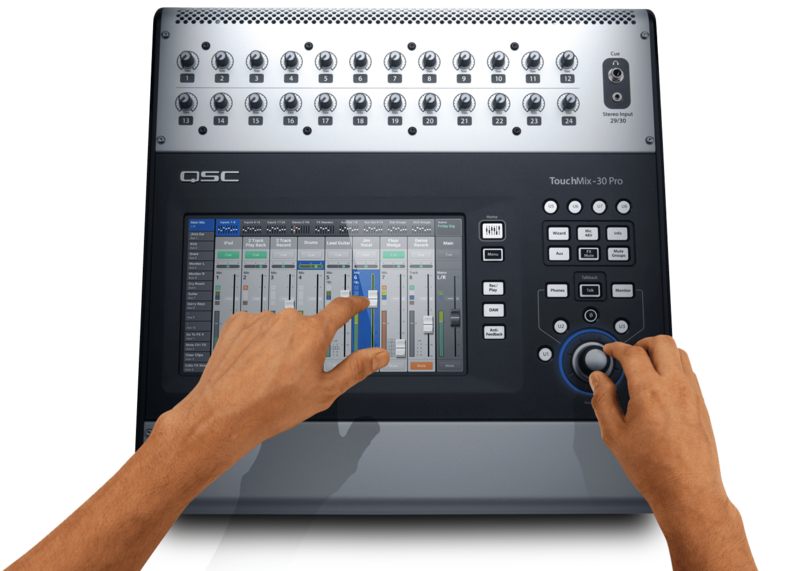 TouchMix-30 Pro offers a 10-inch multi-touch screen that allows simultaneous hands-on control of four faders. The TouchMix Control App for iOS and Android devices (for all TouchMix models) is fully multi-touch and gives you the ability to have 2-handed (or more) control on up to 12 simultaneous devices. With capabilities like these, your ability to control a complex mix in real-time is easier than ever. You really do owe it to yourself to explore TouchMix. Because I need to use a tablet for various functions. A solid app would do the job for me anyway. Because I often have to ride a fader, especially under critcal conditons where failure is not an opton. Because I am making nearly continuous, hands-on level adjustments on multiple channels (moving independently of each other) during the course of a show. Because I often have to move several faders together (like the drums or background vocals). Wireless control is incredibly intuitive and easy with the TouchMix Control App for iOS and Android devices (available for free at the App Store - no mixer required to explore its operation). Should wireless go down, you still have full hardware control at the mixer. It sounds like TouchMix might be a great choice for you. The TouchMix-30 Pro is equipped with a 10-inch multi-touch screen that allows simultaneous handson control of four faders. The TouchMix Control App for iOS and Android tablets is fully multi-touch and available for free at the App Store (no mixer required to explore its operation). We encourage you to try it for yourself.